Typically Astrea’s clients are well versed in connecting their data to Klipfolio. In this instance, their client was unable to use the standard connector. The data they were trying to model was based on a pipeline that was complex with data that was consistently changing over time. Because of this, a more hands-on approach was required. AstreaIT: Have complex data needs from HubSpot (or elsewhere)? AstreaIT is a certified Klipfolio partner that enables sales and marketing teams and Agencies to get more out of applications like Salesforce and HubSpot. Among many other things, they often support Klipfolio customers to get and prepare data for use in Klipfolio dashboards and metrics. Typically Astrea’s clients are well versed in connecting their data to Klipfolio. This customer, a European Marketing Agency with a focus on educational institutions, wanted to better monitor and manage their HubSpot pipeline for individuals and institutions over time across awareness, engagement and opportunities for new vs. existing clients. However, this agency had used custom fields to mark/identify prospects among the recently added companies in Hubspot. It also became apparent that some of the custom fields were constantly changing over time, which made it very challenging to create a single defined API call to capture the data over time. The constantly changing fields and complexity of pulling it from the Hubspot API required a more dynamic and hands on approach to prepare the data for use in Klipfolio. The catch? They didn’t have the right person in-house who had technical know-how to get the job done. So, AstreaIT swooped in and saved the day. To fix the problem, AstreaIT got creative and built a Hubspot pipeline data preparation utility in order to connect pull the pipeline data from HubSpot and push it into Klipfolio. 1) Astrea asked their client to generate a list in their HubSpot account using filters. The fact that the list was dynamic, meant that whenever a new contact was added to the HubSpot account, it was automatically reflected in the list. 2) Their task was then to figure out a way to pull the dynamic list of pipeline data out of HubSpot. This was the first feature of the utility Astrea developed. 3) The second feature of the utility was to use Klipfolio’s API to post the fetched HubSpot data to a Klipfolio data source. AstreaIT has also worked with a Marketing Consulting company, who on top of offering marketing, content writing, advertising, SEO and strategy services, offers their clients the added value of BI dashboard building as a means of reporting. One of the most important things about Hubspot is its portfolio of features that support social media marketing, email marketing, content management, web analytics and search engine optimization. Hubspot also provides an API which allows third parties to access their business logic and data. Unfortunately, the data that they needed to query was related to a variety of different fields including: number of prospects, number of leads (MQLs), SQLs, number of opportunities, and number of clients in contact. So, once again, the data needed to be fetched through multiple custom API queries to be combined to provide the required data, which was no simple task. AstreaIT created dynamic data preparation utility to fetch the required data from the Hubspot API using Java. The utility used HubSpot authentication to connect and make REST-based API calls to HubSpot to pull various sets of data via the HubSpot Contact API. It then parsed through the JSON data returned from HubSpot, combined the data into a single data source,and pushed the resulting data into a Klipfolio data source using the Klipfolio API. To make sure the data is always up to date, AstreaIT created a scheduling service to trigger running the data preparation utility so that updates to Klipfolio data occur from the Hubspot API at regular intervals. 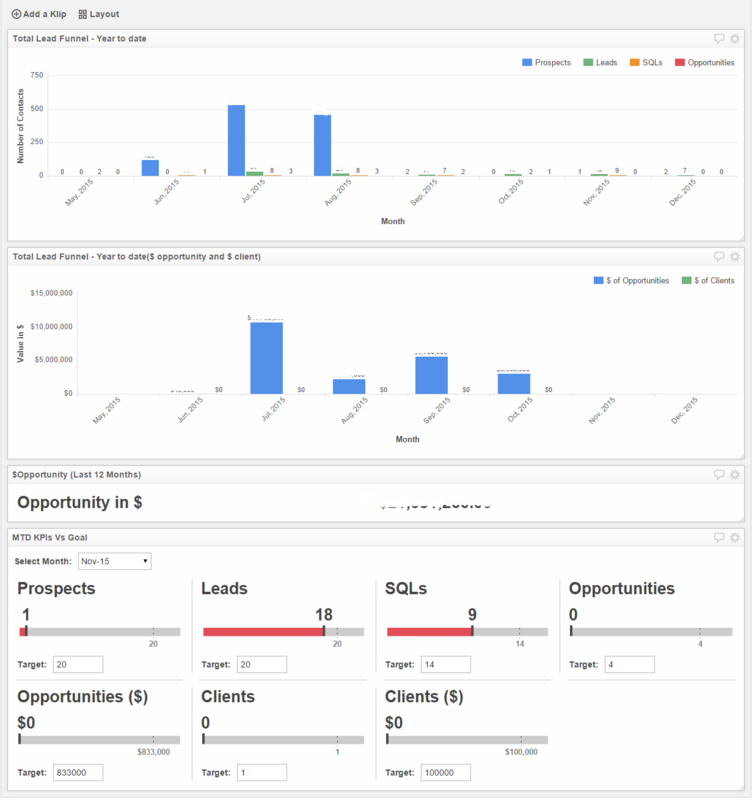 All said and done, the client was able to visualize and track all of their contacts in YTD or MTD format in their Klipfolio dashboard. They are now able to easily check their daily statistics and are able to make performance comparisons for number of prospects, number of Leads (MQLs), SQLs, number of Opportunities, number of Clients for individual contacts. To reduce the challenges getting data out of HubSpot and enable capturing the history of a metric to simplify trending and comparisons, Klipfolio is working with customers and partners to pre-build key metrics including the data pull from HubSpot. This will significantly reduce the manual effort to get data from HubSpot. With our new experience, Metrics Monitoring, you can now get the information you need fast. We are also excited to announce the launch of X new instant metrics specifically for Hubspot, meaning you get the data you need, in just a few clicks.